PALAKKAD: “MALAYALAM cinema today needs good story-based films with artistic value more than new generation films,” Chief Minister Pinarayi Vijayan said here on Saturday. He was speaking at the 46th Kerala state film awards presentation function at the Indira Gandhi stadium grounds. “Film workers should be able to do films based on realities in society. Unfortunately, the portrayal of ‘real human life’ was still not a potential subject for film makers,” Pinarayi said. He said it was noteworthy to see that most of the films in Malayalam and other languages were being shot in the Ottappalam and Valluvanad areas. In order to exploit the potential of the area, the government was speeding up the setting up of the film city. He said that the film society culture of yesteryear should be encouraged. Film societies saw phenomenal growth in states like Kerala. A huge function was organised in such a manner since there was the need for art to blend with the people. Cinemas should be able to absorb both modernity and experimentation so that new age films can be presented to the people. He said that the government was considering screening international film festivals not only in Thiruvananthapuram but also in other cities of the State. The cynosure of all eyes was veteran director K G George who was presented with the J C Daniel award for lifetime achievement. George received the award seated on a wheelchair. The Chief Minister presented a total of 48 awards in various categories. The crowds burst into applause as the Chief Minister honoured the stars who completed five decades in the industry,including actors Madhu, Sharada, Sheela. Music director Sreekumaran Thampy and music director M K Arjunan were honoured with a ponnada. Noted sound designer Resul Pookutty, who received an international award recently was also honoured. 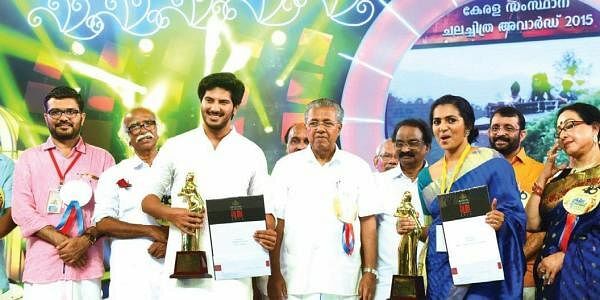 The awards were also presented to Dulquer Salman and Parvathy for the best actor and actress by the Chief Minister amidst the non-stop cheering of the huge gathering.Cultural Affairs Minister A K Balan presided over the meet. The release of the souvenir brought out in connection with the awards function was released by Speaker Sreeramakrishnan. Among those who were present included Ministers E Chandrasekharan, Kadannapally Ramachandran, MPs M B Rajesh and P K Biju, MLAs including actor Mukesh, president of the district panchayat Shanthakumari, District Collector P Marykutty, Culture Department secretary Rani George and Kerala Chalachithra Academy chairman Kamal.Actors Nasser, Jayaram, Bhagyaraj and director Lenin Rajendran were also present.